The Diplomaticos No.2 is a Cuban superstar, a powerful and complex Pyramid, 6.1” (156mm) long, of 52 ring gauge, and comes in a 25 cigars box. This Habano is truly a mature cigar that is not just a milder Montecristo, it has its own character. A 1996 release. When connoisseurs look for Piramides, the Diplomaticos No.2 always shows up in the top of the list. • One of the reasons is that no matter which batch or year of production, the smoking experience is the same. The flavors are always consistent. • The flavors are strong and clear when smoked right out of the box. But the flavors get more profound and rich when aged. Delicate aroma coupled with the flavors of wood and spice. As for all Diplomaticos cigars, the construction of the No.2 is amazing. The wrapper is shiny and has a nice brown color. The whole cigar is dense and firm. Some nice aromas of fruits and soil are emerging from the cigar, mostly around the foot of the cigar. The pre-light draw is firm. Since the beginning the draw is firm but the burn is nice and clean. The ash has a nice grey color and holds on to the cigar for a good inch before falling off. In the first third, the cigar starts off with plenty of woody aromas. After the few first puffs, the oak flavor is joined by many other flavors. The cigar now releases flavors of spices, with cinnamon, clove and nutmeg, and nice charcoaled wood aromas. 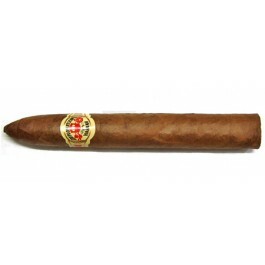 The cigar’s body is medium and the first third finishes on a nice and long wood note. A first third very typical of Diplomaticos smoking profile. The second third continues on a fairly similar flavor profile than the first one. The flavors of sweet spices still dominate, with wood, nuts and forest closely following, in a balanced array. The flavor is unmistakably Diplomaticos. The cigar finishes in the same way as it started, with the same flavors and a medium body. The flavors do not change while smoking in the last third, but why would you want them to? This cigar is delicious! In summary, an easy draw and even burn. A great example of a 1st class piramide.